cups of a variety of root vegetables - choose from sweet potatoes, parsnip, carrots, small potatoes, beets + a red and yellow onion. 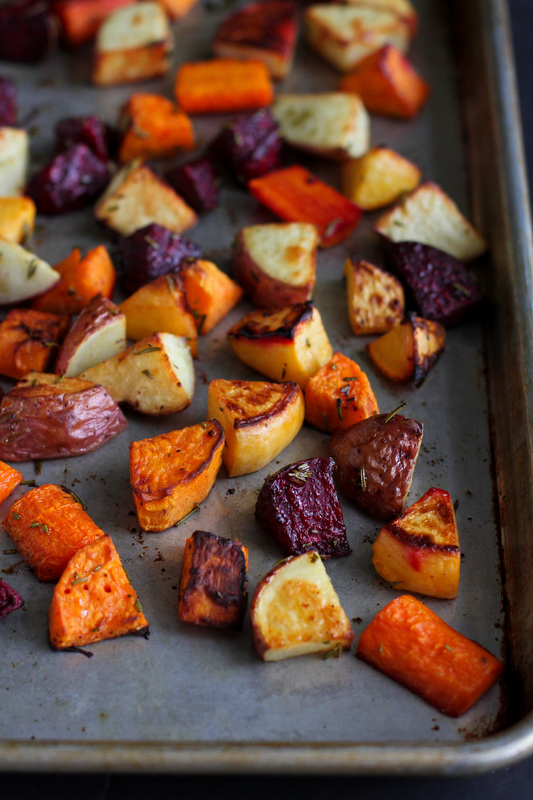 This time of year my family and friends can’t get enough of these roasted root veggies. I’m putting these beauties into the oven twice a week, they’re so popular! Want to make them, too? Super easy, a great alternative to grain, and full of deeply satisfying taste and nourishment. Amazing the next day as leftovers, too, heated up or cold. About 6 cups of a variety of root vegetables – choose from sweet potatoes, parsnip, carrots, small potatoes, beets + a red and yellow onion. Put into a baking tray and bake at 400 for 45 minutes. I start by covering the tray for 30 minutes, then bake uncovered for the remaining time. The veggies should be tender but not mushy. For slightly drier veggies, spread the mixture over 2 baking trays rather than one. Adding some dried cranberries or currents at the end is delish; you can also add cubed apple to bake with the veggies. Olive oil can go to very high temps without becoming rancid; I'm not personally concerned about this. I do recommend a good deal of raw olive oil in the diet, too! How many people do you think this would serve? I plan on having as a part of my Easter meal.